Set at the tail end of World War II, The Monuments Men stars George Clooney (The Descendants) as Frank Stokes, an American art historian who tires of seeing the priceless pieces of art in Europe being pilfered or destroyed by the Nazis. With the President’s approval, Stokes puts together a platoon of fellow museum curators, art professors, and scholars whose mission is to preserve and recapture the artwork that is in jeopardy. Once in Europe, the Monuments Men split up and start to track down missing artwork, pieces stolen both from ransacked museums and confiscated private collections. The boys soon uncover a plan that Adolf Hitler has for his own “Fuhrer Museum,” a compound where he plans to hoard and exhibit every piece of art in Europe. Now that Hitler has lost the war, however, he has given the order to destroy his purloined stash. The Nazis aren’t the only threat looming over the European art world, either; with the war coming to a close, the Russians are moving in and taking things for themselves. The Monuments Men have to locate and rescue as much art as possible before the Russians steal it or the Germans destroy it. Like seemingly every war movie, The Monuments Men is “based on a true story.” The screenplay, written by George Clooney (who also directs) and Grant Heslov (his third outing with Clooney, after Good Night, and Good Luck and The Ides of March), is based on the book “The Monuments Men: Allied Heroes, Nazi Thieves and the Greatest Treasure Hunt in History” by Robert M. Edsel and Bret Witter. The real Monuments Men consisted of dozens of men and women from thirteen different Allied nations who were, just as in the movie, not soldiers, but museum directors, educators, and historians. Because war is hell, there is some violence in the movie, but it’s far from a typical war film. It walks the line between drama and comedy, never feeling too heavy or too light. The Monuments Men combines the realism of Saving Private Ryan, the subtle humor of Inglourious Basterds, and the high adventure of Raiders of the Lost Ark in a way that is pretty fun to watch. 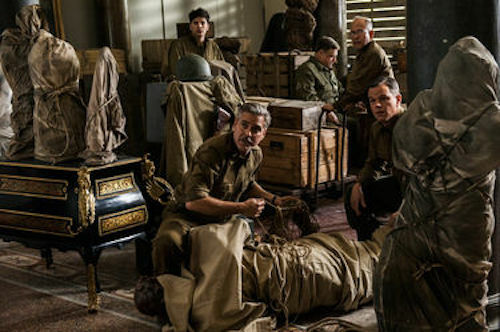 Even though the characters are all middle aged professionals as opposed to fresh-faced soldiers, loss of innocence is a chief theme of The Monuments Men. The characters all leave their comfortable jobs as architects and scholars and such to be thrust into the middle of the war. When they first arrive in France, they land on the beach at Normandy just months after D-Day. There is no fighting, as the beach is under Allied control, but it is the men’s first look at the carnage of the war. As the Monuments Men’s mission progresses, they are exposed to more and more of the evils of war and, although they were rushed through boot camp and haven’t seen any hard combat, they begin to feel like real soldiers. The loneliness and heartbreak of the war is illustrated in one scene in particular where one of the guys listens to a phonograph record of his wife and children singing “Have Yourself a Merry Little Christmas” over the camp loudspeakers while another soldier lays dying on a mobile hospital bed. It is at that moment when the Monuments Men – and the audience – feel so far from home, but still do not waver in their quest to recover and protect the artwork. 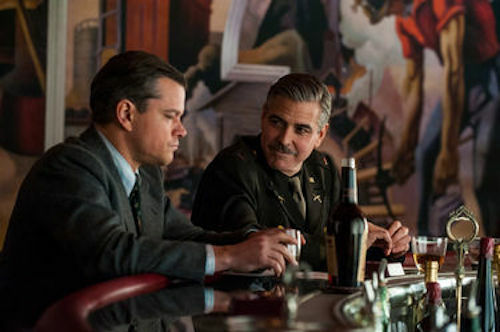 While The Monuments Men is definitely a World War II movie, it is not just about the war. It is about a group of men who risk life and limb for a cause that they feel is more important than their own safety. The Monuments Men is not completely without flaws. 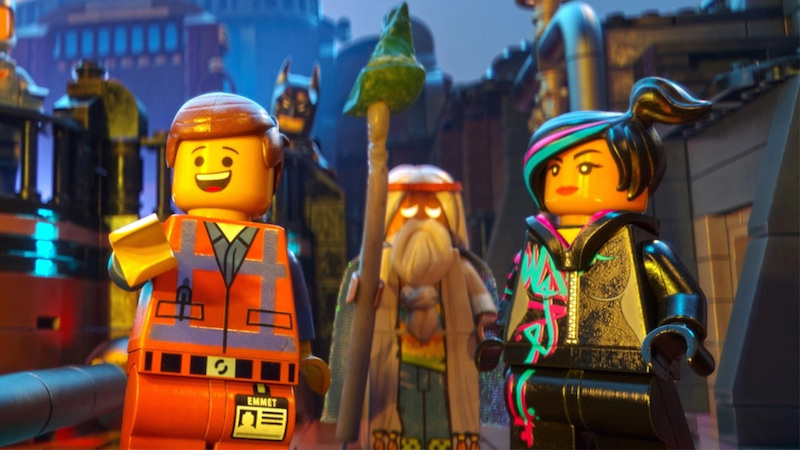 It feels padded at times, with stretches of unnecessary exposition that tries to pass as plot development. Also, there is not a ton of depth to the characters, which is a bit of a shame considering the talented cast that is assembled. However, all of these complaints aside, The Monuments Men is a cool war movie that doesn’t feel like one. Just as Frank Stokes puts together a crack team of art historians to help with his cause in the movie, George Clooney assembles a dream-team cast for The Monuments Men. In addition to Clooney, the platoon itself contains such Hollywood heavyweights as Matt Damon (Promised Land), Bill Murray (Moonrise Kingdom), John Goodman (Argo), Jean Dujardin (The Artist), and Bob Balaban (Moonrise Kingdom). It’s an interesting mix of characters, but it works extremely well, especially when they get paired up for their missions; Murray and Balaban have a great love-hate thing going on, and Goodman and Dujardin make an impressive odd couple in their scenes. Cate Blanchett (Hanna) is an odd mix of spunky and charming as a French museum worker who is sympathetic to the Monuments Men’s cause. 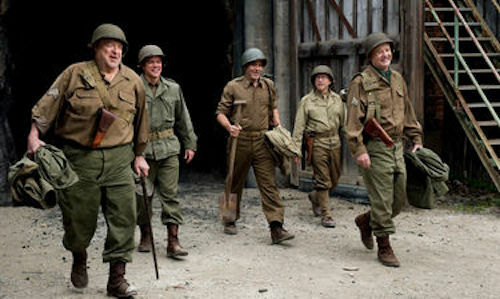 Hugh Bonneville (“Downton Abbey”) plays the soldiers’ contact in Britain, while Dimitri Leonidas (Tormented) rounds out the cast as a Jewish soldier in France who is assigned to be Stokes’ assistant. There’s nothing really challenging about the roles in The Monuments Men, but the veteran cast handles what they are given well, and all of the characters are believable.